But there was one brilliant murder ballad I discovered by myself without the help of Top 40 radio. It was on the 1963 Peter, Paul & Mary album, Moving, the track right before "Puff the Magic Dragon." It was a fast-paced, minor-key tune about som hapless loser who catches his true love, the Lily of the West, with some funky dude. So the enraged cuckold pulls out a knife and kills this "man of low degree." 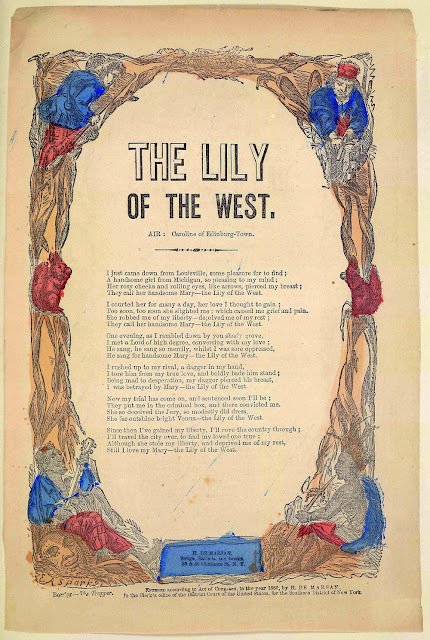 I stepped up my rival, my dagger in my hand/ I seized him by the collar, and I ordered him to stand / All in my desperation, I stabbed him in his breast / I killed a man for Flora, the Lily of the West! I was 10 years old when I came across this song. It was about the coolest thing I'd ever heard. I didn't know it at the time, but "Flora," often called "Lily of the West had been kicking around the folk revival for a few years. Joan Baez did one of the first recorded versions two years earlier. But it goes back at last more than a hundred years before that. According to The Traditional Ballad Index compiled by California State University at Fresno folklore program, Flora goes back to at least to 1839. Sometimes the two-timing temptress was called Mary or Molly. Before the tragic protagonist came from Louisville, he came from England. Some believe the song is Irish in origin. But other than the details, the basic story remains the same. The guy gets starry-eyed over a beautiful dame, finds her in the company of some other jerk, who he kills. He's tried for murder, goes to prison and yet he still loves the gorgeous Flora. Here are some other notable versions, starting with a rag-tag take from the early '70s by Bob Dylan. Fast forward to 1995 and The Chieftains, with Mark Knopfler on vocals, does a slowed down version of the song with a much different melody. Interestingly, a few years after The Chieftains recorded "Lily of the West" with Knopfler, they did a version with Roseanne Cash using the melody I first heard by Peter, Paul & Mary.